Thousands of photos of people holding ‘We remember’ or ‘I remember’ signs in honor of the victims of the Holocaust are put on display on a giant screen at the former Nazi German death camp Auschwitz-Birkenau from 24 until 26 January 2017, ahead of International Holocaust Remembrance Day this Friday. 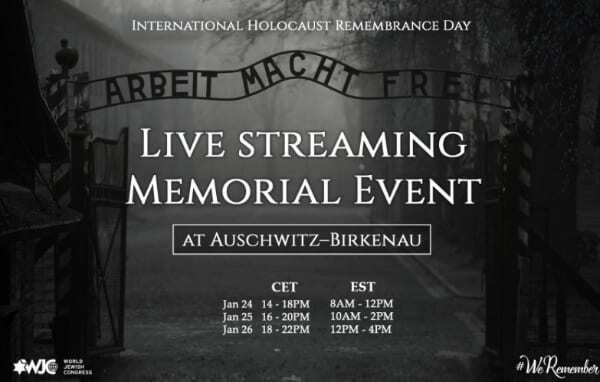 The screening, next to the International Monument at Birkenau, is part of a global social media campaign conceived and run by the World Jewish Congress whose aim is to raise awareness of the Holocaust. More than 100,000 people from every continent have already taken part in the WJC’s campaign, which calls on participants to post their photos to Facebook, Twitter and other social media sites, along with the hashtag #WeRemember. “The goal is to reach those who don’t know much about the Holocaust, or who might be susceptible to those who deny it, and to remind the world that such horrors could happen again. Using the tools of social media we hope to engage the next generation, because, soon, it will be their responsibility to tell the story and ensure that humanity never forget. “Auschwitz-Birkenau was the Nazis’ biggest killing site and is the best-known symbol for the Shoah world-wide. “We thank the Auschwitz-Birkenau Memorial and Museum for allowing the screening on the grounds of the former death camp, and for supporting our campaign,” said World Jewish Congress CEO Robert Singer.